KOOLTRONIC Air-Cooled Rack-Mounted Air Conditioners are particularly suited for applications where internal horizontal mounting is preferred over external panel, door or top mounting. These models are available in two series. The RML Series, with a capacity of 5,000 BTU/H, offers a choice of up to five airflow patterns, allowing installation in any location within a data rack. Using supplied baffle plates the RML can easily be configured for a variety of applications. The H9 and H10 Series offer 3,500 BTU/H. The H9 and H10 are typically mounted internally at the bottom of the cabinet. For rack-mounting at the top of a cabinet use the Compact Plus Series of Horizontal Top-Mount Air Conditioners with optional Brackets for Rack Mounting. 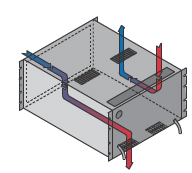 KOOLTRONIC Rack-Mounted Air Conditioners all include EIA-notched flanges. Air-cooled models are provided with attractive 19-inch wide stainless steel grilles and knurled captive fasteners for easy removal. Grille area is 65% open. If preferred, side rails can be supplied. All RML Series models are UL/CUL Listed. CFC-free R134a Refrigerant is used in all RML Series Air Conditioners. The RML Series features condenser airflow at the front of the unit. This unique design eliminates the need for duct work, freeing up more space in the electronics cabinet. 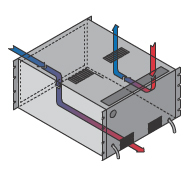 It also allows greater flexibility when locating a unit within an enclosure, and requires only one cutout on the enclosure. 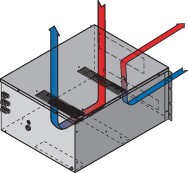 The RML is the only air conditioner on the market with this same-side condenser airflow configuration. The RML Series offers a choice of up to five airflow patterns, allowing installation in any location within a data rack. Using supplied baffle plates the RML can easily be configured for a variety of applications. A non-drying adhesive coating traps a high percentage of particulate matter. These filters are reuseable, they may be washed and recoated with the appropriate filter recoating adhesive. Replacements are available for those which become damaged or otherwise non-serviceable. For RML models the part number is 8752F. The RML Series units have a programmable temperature alarm to alert if early action is required. The RML Series models are equipped with a programmable thermostat, allowing more accurate and versatile performance features. All H9 & H10 models are UL Recognized. All Recognized models are available as Listed at added cost. CFC-free R134a Refrigerant is used in all H9 & H10 Series Air Conditioners. For H9 & H10 models the part number is 1175F.